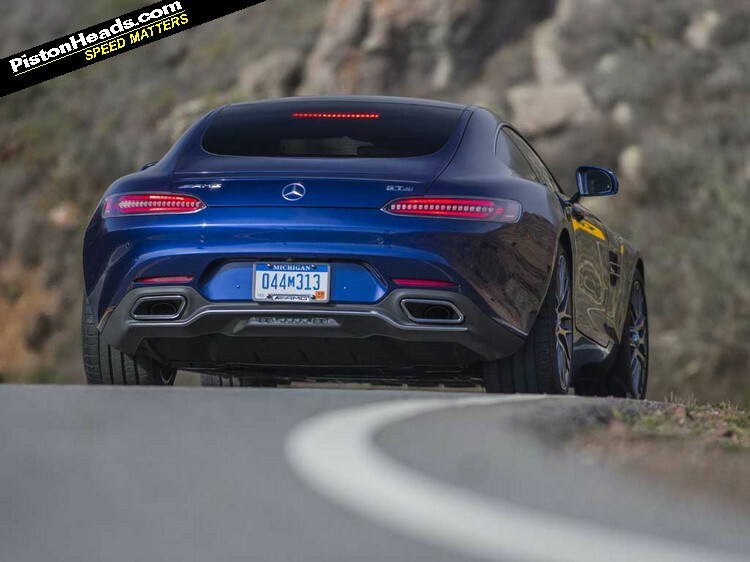 Home > News > German cars > Mercedes-AMG GT: Basic is best? 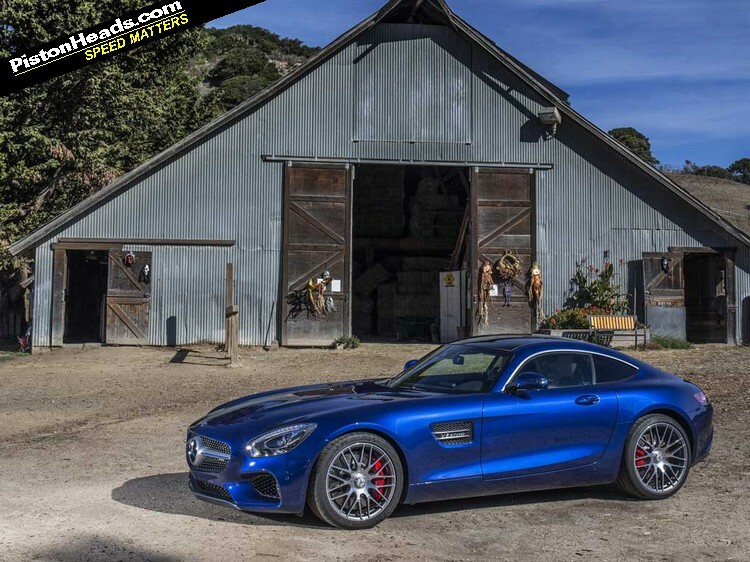 Mercedes-AMG GT: Basic is best? 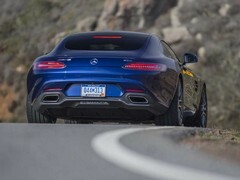 As is the way all the Mercedes-AMG GTs on the Californian launch were S models, 'hot-V' 4.0-litre V8 in 510hp trim and bedecked with all the trimmings. Indeed, the cars we drove on track were the Edition 1s with the fixed wing aero package optional on standard GTs. For avoidance of doubt this is NOT a basic GT! From a starting price of £110,495 and by the time you've added the £1,895 forged wheels, £4,195 'Premium Package', £5,995 ceramic brakes and £1,795 Dynamic Plus Package the GT S is more than an equal for the £120,598 starting price of a 911 Turbo. See our full spec and tech story for more. But what of the 'basic' 462hp £97,195 GT? In conversation with AMG boss Tobias Moers and Jochen Hermann, the man he poached from Mercedes to replace him in the AMG development role, it sounds like it could be the nicer GT. At four dead to 62mph and topping out at 189mph it's hardly lacking in pace either. There's little wrong with the tech-heavy S of course and, as Moers asserts, the extra power, adaptive dampers and fully active diff are worth as much as half a second on a lap of Hockenheim. The S is faster, more configurable and has a wider range of ability but chatting with Hermann you get the sense the base car is far from a poverty spec rolling chassis awaiting a big options spend. Will the GT family grow beyond current two? Take the passive dampers. You can spec the GT up with the S version's multi-setting Ride Control for an additional £1,495 but after hearing Hermann enthuse about the standard items we're itching to have a go. Which is probably why he's an engineer and not a salesman. Supplied by Multimatic, Hermann dug out an internal technical PDF to show off the 'Dynamic Suspension Spool Valve' and remote reservoirs that enabled him and his team to nail a perfect damping balance. The more usual shims, he explains, have a much bigger variance in performance but being able to nail a consistent damping force by machining the valves means they can peg the damping to exactly where they want it, rather than a 'that's about it' compromise. Given how well passively damped AMGs have ridden in the past - think original SLS and the outgoing C63 - it sounds like a proper set-up and far from the budget option you might have expected. Likewise the mechanical locking diff. Moers might be right in asserting its performance advantage against the clock but around LagunaSeca you could feel the S's active diff very cleverly playing with the drive torque. It's very smoothly integrated with the stability control and other systems and helps iron out the power delivery and traction. And there's an advantage on corner entry too, its ability to 'open' reducing inherent understeer Moers acknowledges is there with a mechanical diff. But it's almost too effective, lacking the rawness of typically aggressive mechanical LSDs in previous AMGs. 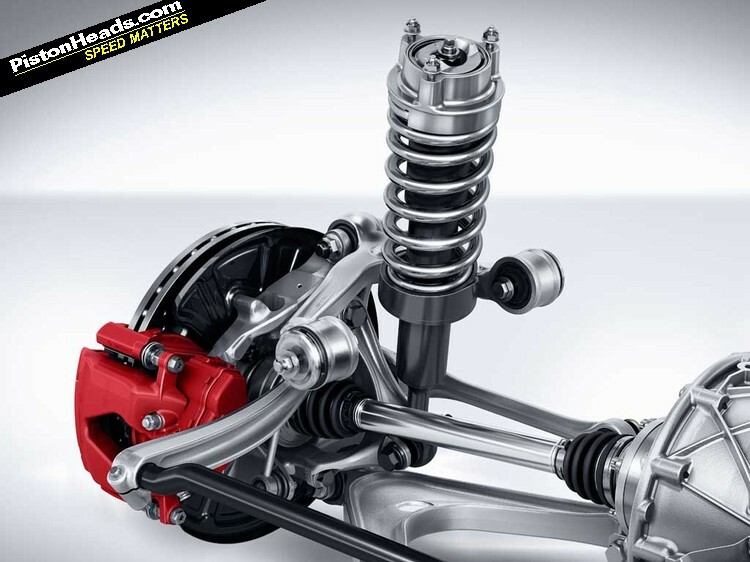 Skids are for kids and all but if you want a more connected and intimate relationship between throttle and rear axle we'll hold out hope for the standard diff to offer that. "In its segment it's a perfect set-up," says Moers of the standard GT. "It's a competitor to Carrera S price wise and it has to be a fast package - the dampers give really nice body control with excellent wheel control." Given he's the first to mention competitors by name we offer the F-Type up as another rival to the GT and he clams up, before acknowledging that he's driven it and is "very happy" with the performance of the GT in comparison. Given the GT weighs at least 110kg less and the transaxle layout distributes the mass more equally you'd expect that; whether such subtleties register when you look at 550hp and £82K for an R Coupe Jag against 462hp and £97K for a base GT remain to be seen. Will there be a cheaper GT to compete with V6 F-Types and entry-level Carreras? 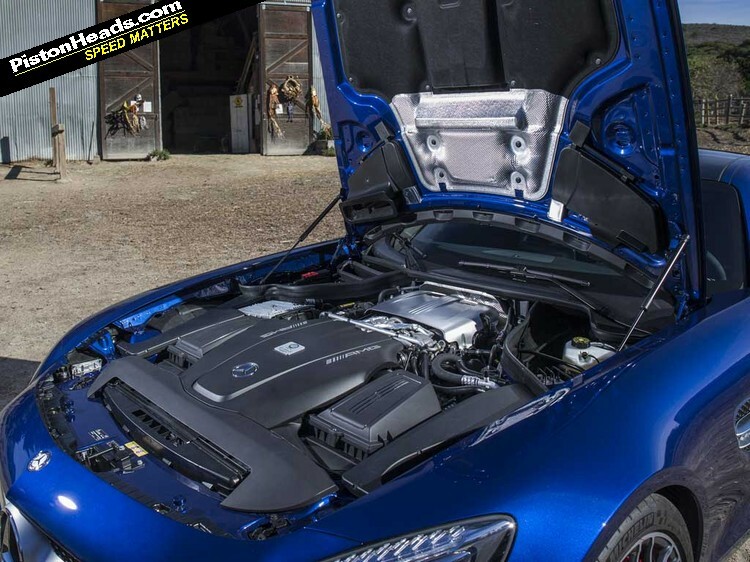 There is, after all, a twin-turbo V6 in the Mercedes engine range... "I don't know. We had a discussion because our costs for the car are really high. It [the V6] is in the company," he acknowledges, "but it's not an inside-V turbo and we don't have the space for it. You need a dry sump in the GT too, it's very specific, you need a new crankcase so by telling you that you can guess..."
And what of more powerful variants? 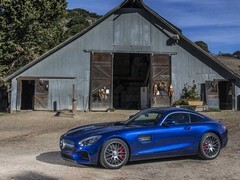 "That engine [the 4.0 twin-turbo] is the new base for the V8 future of AMG," says Moers, "and you can imagine how many horsepower we can get out of that. The stress level for that engine is currently not very high..."
A customer racing version for GT competition is already under development and will be ready for the 2016 season, hopefully to pick up on the success of the SLS. And what of next year's F1 safety car? "Silver is a nice colour," grins Moers. Epilogue: We asked Mercedes why the GT capped revs at 1,000rpm at a standstill and wouldn't do a burnout for the camera and were told there is still a 'Race Start' function like other AMGs but it requires a mystic combination of paddle tugs and settings we didn't locate. Similarly it will apparently light up the rear wheels with everything off and a correct balance of throttle and brake - one for next time we get behind the wheel. It looks a bit 'Bristol Fighter' in that colour - not a bad thing. p.s. skids are not just for kids, ask Mr Harris(if he still speaks to you?)! Doubtful. If you care about the kind of things mentioned here that might make the basic GT a better choice for you, you probably don't want a GT in the first place, but something older and more analogue that will be a million times more involving. If you do like the GT with its turbos and paddles and stuff, you very likely want to go all in with the tech and power and maximise the experience. Said with tongue firmly in cheek; just sore because we weren't allowed to do any. 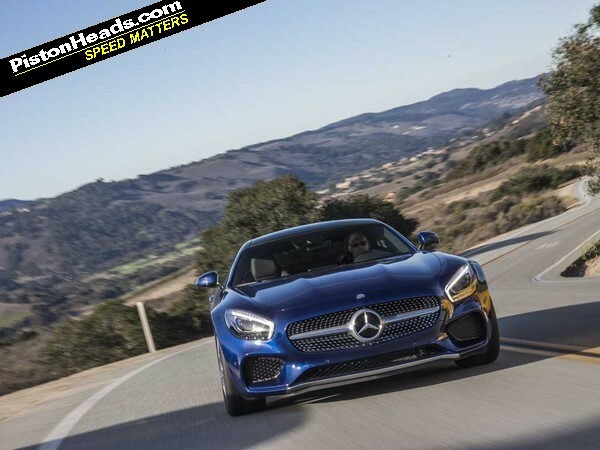 One colleague got a ticking off from the instructor for going large on the final turn at Laguna having turned everything off and, as mentioned, the active diff is 'softer' in lock-up than previous mechanical diffs in AMGs and less inclined to break traction. Good for corner exit speed, less inclined to ignite tyres. Certainly not impossible, just not as keen. Most definitely on speaking terms with Mr Harris. Well, he saw the stripy T-shirt I was wearing on the launch and said "you look like a French lesbian" so situation normal there! And cmoose; probably right but nice to know they went to the bother of engineering the 'analogue' version properly even if only 1 per cent of buyers actually end up with that spec! I've got a psychological issue with spending £100K+ on a car so this might be a perfect fit for me. I do not need the extra power or toys of the S, but I want a modern, reliable, comfortable car that won't be a common site on the roads (the very reason I had a V8 R8 a few year back). 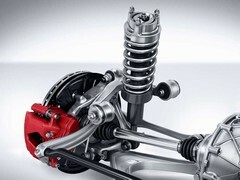 The non-S sounds very appealing - the dampers sound like properly trick passive units, a nice mechanical locking diff etc. Sounds great! Who needs more electrickery?